Bales Worldwide is featuring a new and unique rail adventure across Southern India, aboard the decadent Golden Chariot. This 88 berth luxury train is the latest to launch on the sub continent and joins other great Indian rail experiences, such as the 'Palace on Wheels' in Rajasthan, and the 'Deccan Odyssey' in Maharashtra. It offers a new and varied circuit which offers heritage, Palaces, monuments and wildlife. The train, named after a famous stone chariot at the World Heritage Site of Hampi, starts and finishes its journey in Bangalore, taking in a wealth of cultural and historical sites. From resplendent palaces and ancient temples, to wonderful wildlife and golden beaches - this is a journey through the very best that the Karnataka region has to offer. Prices start from £1,430 per person based on two sharing, including seven nights on the Golden Chariot, two nights in the Oberoi Bangalore, full board and British Airways economy class flights. There is also the option to take the shortened six night journey to Goa and combine with a few days on the beaches. All cabins are fully air conditioned and come equipped with private bathroom, a writing desk, wardrobe, Wi-Fi, LCD television and DVD with six satellite channels. Each features intricate carvings on the ceiling and the wall panels and furniture are inspired by Mysore and Hoysala architecture. Each coach has been named after the dynasties that ruled Karnataka - Kadamba, Hoysala, Rastrakota, Ganga, Chalukya, Bhahamani, Adhilshahi, Sangama, Shathavashna, Yudukula and Vijayanagar. The Golden Chariot has two restaurants serving excellent food, a lounge bar where passengers can enjoy an evening cocktail and even a gym which offers Ayurvedic massages. The seven night journey takes in the royal city of Mysore with its majestic palaces and fortresses, Kabini and the wonderful Rajiv Gandhi National Park, the magnificent Hoysaleswara Temple near Hassam, the Jain pilgrimage centre of Shravanabelagola with its 58ft statue of Lord Gomateswara, the stunning World Heritage site of Hampi, the breathtaking temples and ruins of Badami, Pattadakal and Aihole, and finally the relaxing, golden beaches of Goa. Passengers can recline in comfort and watch the beautiful scenery unfold indulging in a spot of shopping in the perfume market at Mysore, enjoy the excitement of a jeep jungle safari in Kabini, explore the incredible remains of Hampi and experience the Badami caves. 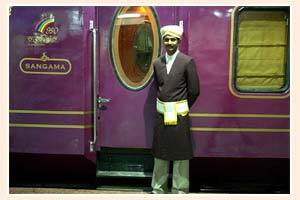 The Golden Chariot is now available as part of Bales' extensive tailor made travel options in India.